The belt stabilizes and reduces stress on the spine. One of the most commonly accepted benefits of the use of lifting belts is the increase in intra-abdominal pressure. The intra-abdominal pressure could be thought of as if it were a balloon that is inflated inside the abdomen. When the intra-abdominal pressure is increased, the pressure inside the abdominal cavity pushes the spine and stabilizes it internally, while the muscles of the core and the lower back stabilize it from the outside. 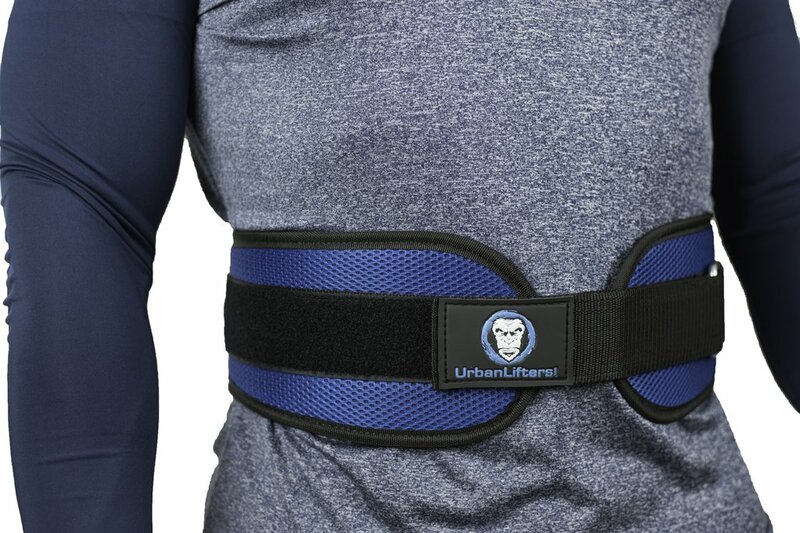 The body responds to the increased intra-abdominal pressure created by the belt creating a stronger and stiffer core, thus stabilizing the spine much better and reducing stress when it receives large loads in the lift. The abdominal belt serves to protect the abdominal area when we pull with very heavy weights and our stabilization system (the core: the abdominal girdle and deep abdominal muscles) is too short for us to train safely. That is the moment in which we must use the belt. The belt acts as an external stabilizer: what we do by means of the belt is to create a higher intra-abdominal pressure, thus hardening the area of the rectus abdominis and the lumbar area in order to exert more strength and gain stability. We can do this voluntarily by learning to activate the abdomen when we perform free-weight movements. The use of the belt is suitable when we work with very high weights and in high performance training, but at the user level it is more advisable to train our abdomen, especially with isometric exercises that involve the deep musculature of the core. The dilemma is this: do you train to compete in power lifting? Then put on a belt when you lift a lot of weight: protect your work tools. Do you train for health and to be efficient in your day to day? It is enough to train your core and apply this training to the exercises you perform in your routine. After all, when you have to make a move tomorrow and take a heavy box of books off the floor, you will not be wearing a belt, but you will have your core trained to do it safely. The continued use of belts could affect the learning of abdominal muscle contraction during uplifts, particularly in the case of novice lifters. This problem has an easy solution if you work the area of the ‘core’ in an appropriate way with ancillary exercises in order to strengthen that area. A good ‘core’ must be prepared to stabilize in the same way as the belt does in the surveys. Let’s say you are an experienced lifter and suffer serious pain during your deadlifts. You are performing hyper-back extensions to move larger weights and instead of stopping or working with smaller loads, you decide to use a belt. Its use, surely relieve some of the pain in your uprisings and keep moving high weights. The pain will inevitably return and surely even stronger and perhaps you have damaged the affected area more. With this, we mean that belts are not substitutes for good form. The technique must remain correct even when they are used and it is not advisable to use them when you have an injury to try to camouflage it. As we said earlier that its use can lead to incorrect progression in the development of the ‘core’, it can also have the same effect in the area of the low sword, especially if the belt is used when training high repetitions / low weights. Dips are a compound resistance training exercise targeting the triceps and pectorals (chest) muscles. If body weight resistance alone is not enough for your training needs, it is possible to add weight with a dumbbell or weighted diving belt to increase the resistance. If you can perform 15 to 20 dips with the sound technique, you are ready to add weight. Always use proper technique and work within your own capabilities. 2 Fit the dip bar with an oblique handle -. So the bar is diagonal under your palm. Some dive bars vary in width – the wider your grip, the more emphasis is placed on the chest; a narrow handle targets your triceps. Slightly wider than the width is ideal. 3 Bend your knees if you lean slightly forward. The more you bend your knees, the more you lean forward to counterbalance, requiring greater use of the pectoral muscles. 5 Exhale and push back to the starting position. ; keep your back straight throughout. 6 Perform three to four sets of eight to 10 repetitions of hypertrophy (increase in muscle mass). In the weight room, there are guys who put on a belt to do the weight training. What is it exactly for? Should we wear it all the time? The belt is used to protect the lumbar spine. As part of the practice of bodybuilding, it is best to book the belt for the heaviest series of exercises like the squat, the deadlift, the rowing bar bent-over or developed military standing. For moderately high loads and other exercises, I do not think it’s helpful. With or without a belt, you must be careful to do all the exercises to avoid getting hurt and “think about the body” as a whole. Like a car, the belt gives you extra security but if you drive badly, you’ll have an accident sooner or later. Protecting your spine also means avoiding muscle imbalances that often cause pain or injury. For example, bodybuilders strengthen their abdominal muscles, but often forget the back and lumbar. It is also necessary to do regular stretching to maintain muscle flexibility but also joint and tendon (tendons, connective tissue …). Stiffness increases the risk of injury and leads to decreased mobility. For example, ante version of the pelvis (it goes forward) may be hampered by the stiffness of the hamstrings or gluteal muscles, and retroversion by the stiffness of the anterior rectus muscles or iliopsoas. I remember in the weight room all the difficulties that had been experienced by the coach to have the squat done to a person, stiff as a stick, who could not position himself and whose lumbar curvature was catastrophic. Flexibility is not negligible. Take the example of the squat or deadlift, two strength training exercises which are often used heavy loads. When performing the movement, you contract your abdominal muscles strongly and block your breathing in the delicate part to stabilize the posture. This contraction of the abdominal muscles increases the pressure inside the abdominal cavity, which makes it more rigid and therefore more capable of ensuring the transfer of forces between the thorax and the pelvis. This has the effect of reducing the pressure on the discs that are between the vertebrae and therefore play a protective role for the lumbar spine. Biomechanically speaking, the lumbar belt increases the rigidity of the abdominal cavity and reinforces this phenomenon. Studies have shown the benefit of wearing the belt for weightlifters in order to protect the lumbar spine. The wearing of the belt increases the pressure of the abdominal cavity, improves the control of movement and the synergy between the muscles to the point that weightlifters wear the same belt to lift so-called “light” loads. It is often understood that wearing a lumbar belt prevents the work of the abdominal muscles and the strengthening of the stabilizing muscles of the spine, which would result in the effect of de-straining the muscular atrophy and thus the increased risk of injury. This argument against the wearing of the belt is unfounded. Wearing the belt does not cause long-term muscular atrophy and does not affect muscle strength capabilities. The wearing of the belt during lifting of the load tends to impede breathing by decreasing the breathing capacity and accelerating its frequency. Continuous wearing of the belt results in reduced venous return and increased blood pressure. It can also promote umbilical or hiatal hernias. The belt should be tied at waist level, as tight as possible. Many users do not close enough and in this case it is of no use. We advise you to buy a thick and rigid leather belt. Next Next post: How to Choose Flat Shoes for Squats You’ll Love!